>Remember this from high school? One afternoon, I was wandering through the parking lot at work when I could hear this strange music. Thinking nothing of it, I proceeded on my errand. When I came back 10 minutes later, I could still hear the same music. At first I thought it was someone sitting in their car, but alas it was this big reddish balloon. 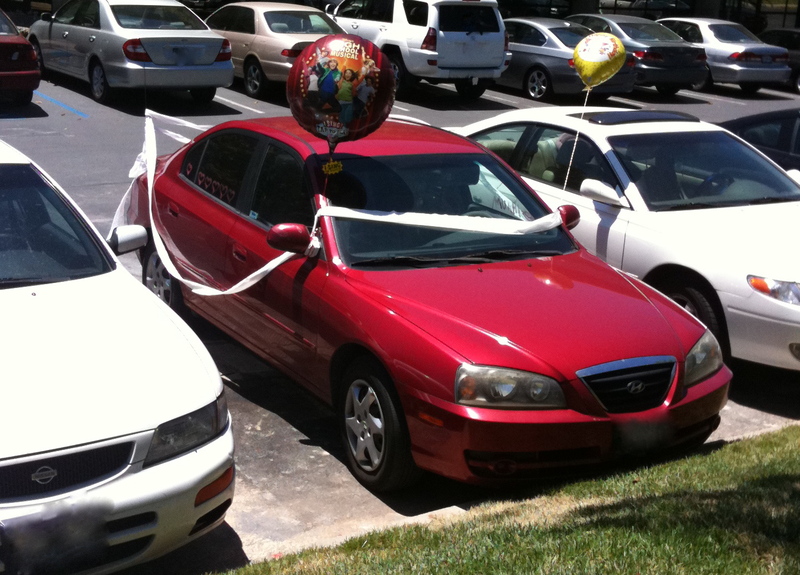 Someone decorated a car like we used to back in high school for birthdays or because we were bored, but they attached one of those highly annoying singing balloons. The same refrain from a random High School Musical song was on infinite repeat because the wind kept pushing the “I Sing!” button. A friend of mine went to the Tesla show last night. I didn’t go because I’m a fool and forgot to buy tickets in time. Fate decided to add insult to injury because she and her fiance got an all access backstage pass. That could have been me!! I could have been doing the Wayne’s World showing of my badge to everyone thing. If you don’t know what I’m talking about, please do yourself a favor and watch the scene where they go backstage at the Alice Cooper show. We’re not worthy!